UNITED NATIONS, March 21 -- Weeks after the UN belatedly apologized for announcing that Cote d'Ivoire's defiant leader Laurent Gbagbo was illegally importing attack helicopters from Belarus , the Office of the Spokesperson for Secretary General Ban Ki-moon told the Press on the night of March 18 that another statement on Cote d'Ivoire had been “read out” by the Deputy Permanent Representative of China, the president of the Security Council for March. * The members of the Security Council express their indignation at the UNOCI reports over brutal attacks against unarmed civilians alledgedly committed by the Ivorian Defense and security forces (FDSCI) at a market in Abobo yesterday [etc]. This seemed strange, since the stakeout with UN TV for the statement to be read was canceled. 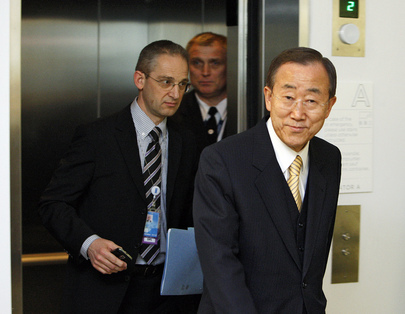 (Coucnil members told Inner City Press there was dissatisfaction, particularly after Ban Ki-moon's mis-speaking about the Belarus helicopters, with his statement's, then the draft's, use of the word “allegedly”). Was this statement actually “read out” by the Council presidency? Is so, why was no notice given, resulting it in being unable to ask any questions? If it wasn't read out, why did your Office say it was? But Ban's spokesmen Nesirky and Haq did not answer. As their office continued sending out press releases, Inner City Press reiterated the Cote d'Ivoire questions on March 19; again, no answer. Coming in to the UN on March 21, more than 60 hours after Ban's Spokesperson's Office's announcement that the Cote d'Ivoire statement had been read out, that Office made a public address system announcement that the Chinese DPR would be making some presentation to the press at 11:30 am. No topic was listed. At the Security Council stakeout, it turned that only now was the Cote d'Ivoire statement being read out -- the DPR had to explain that the word “yesterday” meant, in fact, four days ago. Inner City Press asked if there had been a stakeout late on Friday: no, was the answer. Inner City Press reported this on Twitter: the “text was NOT read out, Chinese Mission tells Press. Still no answer from OSSG.” Inner City Press was told that only one media organization, Chinese, had been called on Friday night. Back at the UN noon briefing, Inner City Press asked Nesirky to explain -- as had been requested more than 60 hours previously by email -- and if in the last three days the UN Mission had been able to move past “allegedly.” Nesirky said he had nothing on that second part of the question. On the first, he (tw?) insisted that Inner City Press had just gotten the answer from the Chinese spokesman. (On another question about compliance with UN rules and Charter, he told Inner City Press to “ask Jordan. This seems to be the new strategy to not answer questions about the UN: tell journalists to ask a particular member state. But it was Ban's Spokesperson's Office which put out a mass email on March 18 that the Cote d'Ivoire statement had been “read out.” Inner City Press asked if Ban's office defines a phone call to one media, from China, to be a “read out” of a Security Council statement. Nesirky would not answer, saying again and again, you spoke with the Chinese spokesman. Yes, we did. Only last week, Nesirky acknowledged that his Office made an error in emailing out a Ban Ki-moon statement estimating that one half of rubble in Haiti will be addressed by the end of 2011, and then issuing an "amended" statement dropping the estimate. Unless Ban's Spokesperson's Office defines a single phone call to Chinese media as a "read out" -- an argument Inner City Press repeatedly but unsuccesfully invited Nesirky to make -- another error was made. Why not acknowledge it? How for the UN Secretariat do you explain the omission of any reference to Ivorians lacking medicine due to restrictions on ships, and please state what you will do to have this UN (mis) statement corrected? There has been no answer on that. None. UNITED NATIONS, March 18 -- At 5 pm on Friday at the UN in New York, the Office of the Spokesperson announced that on Cote d'Ivoire there would be a Security Council press statement read out in 15 minutes. A UN TV camera was set up. Inner City Press had been in front of the Council, reporting on an unrelated meeting about Kenya and the International Criminal Court and was told by diplomats there were problems with the Cote d'Ivoire statement. Minutes later, the UN TV camera before which the Council president would have read out a Press Statement was disassembled. It is canceled, Inner City Press was told. 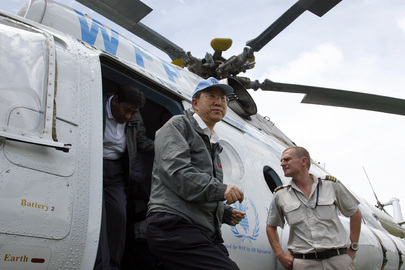 While Ban Ki-moon's head of Peacekeeping Alain Leroy publicly apologized for what he called the “mistake” of the allegation that defiant Ivorian leader Laurent Gbagbo was bringing in attack helicopters from Belarus, his UN's objectivity is being called into question. Ban's head of Humanitarian Affairs Valerie Amos, when asked by Inner City Press if she is concerned about sanctions on Cote d'Ivoire hurting civilians including people who can't get money out of closed banks and can't get pharmaceuticals said those are not the complaints she has been hearing. But on March 17, when Inner City Press asked the UN's Humanitarian Coordinator for Cote d'Ivoire Ndolamb Ngokwey about the impact of sanctions, he admitted that the central pharmaceutical depository has no medicine, because ships can't come in to the port. He said he's trying to advocate “locally,” to embassy in Cote d'Ivoire about this. But Amos and Ban are not telling the Security Council about it. Strikingly, even with this admission the UN's press release of the March 17 press conference with Ndolamb Ngokwey did not include Inner City Press's question or Ndolamb Ngokwey's answer about pharmaceuticals. Click here for UN press release, but here for actual video. Inner City Press: In Côte d’Ivoire; I mean, obviously there is this market attack which is, you now, quite bad, but there, I also, I wanted to ask, I don’t know if the UN had said anything about, Human Rights Watch has documented what they say are killings by the pro-Ouattara forces as well, in this village of Anonkoua-Kouté. They say that, you know, some 60 pro-Ouattara fighters killed nine civilians. And I, you know, obviously, the Gbagbo Government there says that the UN has, is, that its reporting is very partial, etcetera. So, I am just wondering, has the UN system had anything to say about this, you know, whatever, misdeed, at a minimum on the other side and where have they said that? Spokesperson Nesirky: Human rights are fundamental and are for everybody. The mission in Côte d’Ivoire of the United Nations has as its mandate to protect all civilians in an impartial way. And that also includes monitoring human rights abuses from wherever they may emanate. And I know that my colleagues there would certainly look into any allegation from whichever quarter. And if I have any further details, then clearly I would let you know. Inner City Press: That would be great. Especially, you know, if they’d said anything in the past because it seems like it was a widely, at least alleged, thing there. Spokesperson Nesirky: As I say, we need to be very clear that human rights are universal and that any attack from whichever side, any provocation from whichever side needs to be looked at. The Spokesman, Martin Nesirky, didn't say, or email, any of this to Inner City Press, just the referenced statement, expressing Ban's shock at “the firing of mortars, allegedly from a military camp of forces loyal to Mr. Gbagbo” -- with the word “allegedly” which, in the wake of Ban's error on the Belarus helicopters, led to the shooting down of the proposed Security Council press statement on Friday afternoon. And so it goes at this UN. Watch this site. UNITED NATIONS, March 2 -- A day after UN Secretary General Ban Ki-moon's spokesman Martin Nesirky declined to admit Ban had made any mistake by alleging that helicopters from Belarus were delivered to Cote d'Ivoire's defiant leader Laurent Gbagbo, the chief of UN Peacekeeping admitted that the allegation had been false, and that he had apologized to Belarus. Inner City Press: what do you learn from this? When has Ban Ki-moon in the past issued this type of, yes, “half-baked” might be one word; this is the kind of words that are being thrown around out there. 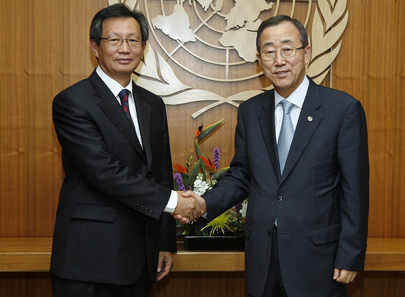 What’s the standard for the Secretary-General to put out a statement such as he did on Monday morning? Spokesperson Nesirky: As I said, given the seriousness of the matter, and the explanation that I have given, - it may have been long; it was nearly as long as your question – to try to, it was an attempt to try to be clear. That’s why I wanted to give it in some detail. Given the seriousness of the matter, it was decided that this would be raised publicly. And again, the other point with this is that any deployment of attack helicopters would clearly present a serious threat to civilians, to peacekeepers, and so on. Inner City Press: I am thinking, contrasting it to things, for example in Darfur where the UN is so cautious in terms of, even when things or bombs are falling, they say, “we can’t say”...it’s perfectly fine that it’s a long answer; I am just wondering, it doesn’t seem to directly address the idea that this was an improper side-taking; that it reflects sort of a lack of judgment. Do you accept that? Is there any re-thinking of the Secretariat’s part that maybe that was a mistake what went out Monday morning? In a press release issued on Sunday, which was picked up by news services around the world, the SG urgently requested a meeting of the Security Council on Cote d'Ivoire. How many times over the past year has the Secretary-General urgently requested meetings of the Security Council on other matters? Please specify the situations and dates upon which he issued such calls. Who is accountable (and responsible) for the content of the "news stories" that are put out by UN News Service on the webpage called "UN News Center"? Does the UN News Service operate with editorial independence of the Office of the Secretary-General, or do they take instructions from the Secretary-General or his advisers on the content of stories? Who was responsible (meaning what was the name of the individual who issued the instruction) for removing and then reediting and reissuing a UN News Service story concerning the Secretary-General's claim that Belarus had violated Security Council sanctions by allowing helicopters to be dispatched to Cote d'Ivoire? Yes or no, will the UN admit that the UN News Service received instructions from the Office of the Secretary-General to remove the first story, edit it substantially, and replace it with a second story, without issuing a correction which acknowledged the substantial changes made to the first story? Subsequent to the SG's accusations against Belarus, Google News has indexed more than a thousand actual news stories which reference the allegations. Is the UN going to request corrections or make a statement saying it no longer stands behind those allegations? In the revised version of the Belarus-Cote d'Ivoire story posted yesterday afternoon by the UN News Service, the following sentence was added: "On Monday, some media reports identified Belarus as the source of the helicopters and equipment." Please respond to the idea that the UN itself was the source of the allegation that Belarus had violated sanctions by providing helicopters to Cote d'Ivoire? Not only has Nesirky not answered any of these questions 30 hours later -- he has not even acknowledged receipt of the questions, and he took no questions at the noon briefing. Inner City Press asked Le Roy how the UN would correct the media stories that had been based on the UN's false report, and if the incident would undermine UN claims to impartiality in Cote d'Ivoire. Watch this site.